So despite mild protests from Vidur, we went ahead and got a cake. Death By Chocolate. After all, 16 doesn’t come every day…heck, every year, right? Luckily, it was a holiday, since exams are going on and we had a very pleasant day. We woke him up with “happy birthday” in different pitches. I remembered all the “nakshatrams” we made such a big deal of – with you insisting that we must celebrate it every month until he was at least five years old. We celebrated until he was 12, thanks to you. We reminisced about all those special days. You always believed in getting him everything he wanted, within reason. Your logic was – he must not covet or yearn for something. We didn’t always agree about that, but I think you were right. Today, he’s a happy person who is content and wise about what he asks for. He is careful about expense. He looks for value. So what did he want for his birthday? No prizes for guessing. A particular book. Now pat me on the back for ordering it a week ahead and hiding it under the bed in a box. Of course, I secretly worried he would somehow drop something on the floor, bend down and become curious about the new box. That did not happen of course. As a result, although I was dying to tell him – I managed to wait, thanks to Sury’s support, until the big day and oh, what a reward it was to see his joy! After lunch, we all had a piece of cake. Must have dropped some crumbs on the kitchen counter. So imagine my pleasant surprise when my ears picked up “happy birthday to you” from the kitchen. Curious, I went to see and saw Vidur singing with his face close to the counter. I went closer and saw a couple of tiny ants sedately carrying a tiny crumb of cake. Oh yes, they deserved it alright. I quietly tip-toed away and went back to work, not wanting to disturb that lovely moment. I remembered those days when, during a particular season, there would be lots of ants seemingly out of nowhere. You’d say they came because it was cool inside. We used to place trays of water with stands on which we kept the food to avoid the ants. One day, after arranging all that, we had forgotten one box on the counter. Later when we went into the kitchen to make tea, we found hordes of ants around the box. None actually inside, but they had found a crumb nearby. You said they totally deserved to be rewarded for their efforts. Makes me laugh and cry to think of all those moments! What a weird memory – when I was little, I remember the aunts saying that if we ate an ant by mistake, it was very good for the eyesight. Ewwww. See what I found today in the archives! July 15, 2001. Our budding artist. I hope that he had a Happy Birthday. Happy belated birthday to the little champ, what book did you gift him, would love to know that knowing his taste in mythology. And loved the walk down memory lane, yet again, this time with the ants. Your love, your pride, resonates so beautifully in your posting. 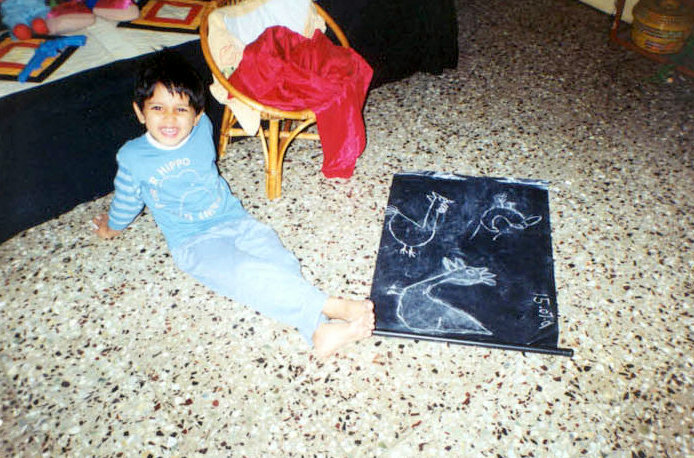 A memorable birthday and a photo of your beloved budding artist. A smile to melt the heart. Good God, I hate ants on my food.